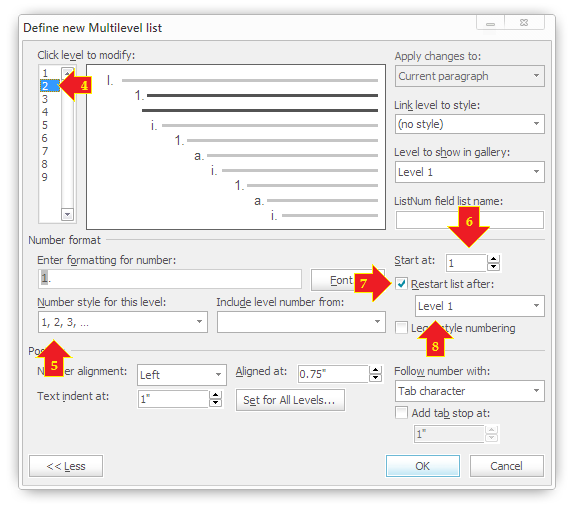 15/06/2012 · So after you have applied the built-in number scheme and with the cursor still in the first heading 1, go back to the list gallery and click Define new List Style (name the list style) > Format > Numbering. • Go back to the temporary document (the one you created in the Body section) with the reference list and copy the list. • Paste it back into your document. The reports I have to generate have to use a multi-level numbering system so each of the headings in the report is preceded by a number that's somewhere in the 1.1.1 hierarchy/family. However, the text in the reports has to be justified but if the heading is justified, particularly if it's short, then it looks ridiculous.